See full infographic: JPG | PDF© VIKTOR KOENIn 1755, French physician and scientist Charles Leroy discharged the static electricity from a Leyden jar—a precursor of modern-day capacitors—into a blind patient’s body using two wires, one tightened around the head just above the eyes and the other around the leg. The patient, who had been blind for three months as a result of a high fever, described the experience like a flame passing downwards in front of his eyes. This was the first time an electrical device—serving as a rudimentary prosthesis—successfully restored even a flicker of visual perception. More than 250 years later, blindness is still one of the most debilitating sensory impairments, affecting close to 40 million people worldwide. Many of these patients can be efficiently treated with surgery or medication, but some pathologies cannot be corrected with existing treatments. In particular, when light-receiving photoreceptor cells degenerate, as is the case in retinitis pigmentosa, or when the optic nerve is damaged as a result of glaucoma or head trauma, no surgery or medicine can restore the lost vision. In such cases, a visual prosthesis may be the only option. Similar to cochlear implants, which stimulate auditory nerve fibers downstream of damaged sensory hair cells to restore hearing, visual prostheses aim to provide patients with visual information by stimulating neurons in the retina, in the optic nerve, or in the brain’s visual areas. While brain prostheses have yet to be tested in people, clinical results with retinal prostheses are demonstrating that the implants can enable blind patients to locate and recognize objects, orient themselves in an unfamiliar environment, and even perform some reading tasks. 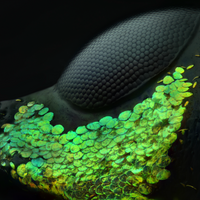 But the field is young, and major improvements are still necessary to enable highly functional restoration of sight. Henri Lorach is currently a visiting researcher at Stanford University, where he focuses on prosthetic vision and retinal signal processing. In the subretinal approach to visual prosthetics, electrodes are placed between the retinal pigment epithelium (RPE) and the retina. (See illustration.) There, they stimulate the nonspiking inner retinal neurons—bipolar, horizontal, and amacrine cells—which then transmit neural signals down the retinal network to the retinal ganglion cells (RGCs) that propagate to the brain via the optic nerve. Stimulating the retinal network helps preserve some aspects of the retina’s natural signal processing, such as the “flicker fusion” that allows us to see video as a smooth motion, even though it is composed of frames with static images; adaptation to constant stimulation; and the nonlinear integration of signals as they flow through the retinal network, a key aspect of high spatial resolution. Electrical pulses lasting several milliseconds provide selective stimulation of the inner retinal neurons and avoid direct activation of the ganglion cells and their axons, which would otherwise considerably limit patients’ ability to interpret the spatial layout of a visual scene. In the subretinal approach to visual pros­thetics, electrodes are placed between the retinal pigment epithelium and the retina, where they stimulate the nonspiking inner retinal neurons. 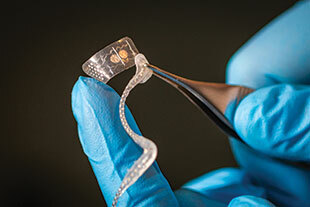 The Boston Retinal Implant Project, a multidisciplinary team of scientists, engineers, and clinicians at research institutions across the U.S., is developing a retinal prosthesis that transmits information from a camera mounted on eyeglasses to a receiving antenna implanted under the skin around the eye using radiofrequency telemetry—technology similar to radio broadcast. The decoded signal is then delivered to an implanted subretinal electrode array via a cable that penetrates into the eye. The information delivered to the retina by this device is not related to direction of gaze, so to survey a scene a patient must move his head, instead of just his eyes. The Alpha IMS subretinal implant, developed by Retina Implant AG in Reutlingen, Germany, rectifies this problem by including a subretinal camera, which converts light in each pixel into electrical currents. This device has been successfully tested in patients with advanced retinitis pigmentosa and was recently approved for experimental clinical use in Europe. Visual acuity with this system is rather limited: most patients test no better than 20/1000, except for one patient who reached 20/550.1 The Alpha IMS system also needs a bulky implanted power supply with cables that cross the sclera and requires complex surgery, with associated risk of complications. 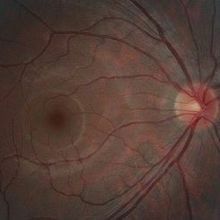 STIMULATING ARRAY: This prototype suprachoroidal array, which is implanted behind the choroid, can be larger than prostheses inserted in front of or behind the retina.COURTESY OF NESTLAIR PHOTOGRAPHYTo overcome these challenges, my colleagues and I have developed a wireless photovoltaic subretinal prosthesis, powered by pulsed light. Our system includes a pocket computer that processes the images captured by a miniature video camera mounted on video goggles, which project these images into the eye and onto a subretinally implanted photodiode array. 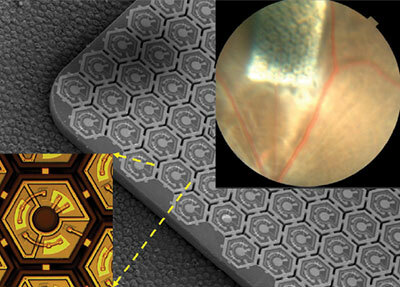 Photodiodes in each pixel convert this light into pulsed current to stimulate the nearby inner retinal neurons. This method for delivering the visual information is completely wireless, and it preserves the natural link between ocular movement and image perception. Our system uses invisible near-infrared (NIR, 880–915 nm) wavelengths to avoid the perception of bright light by the remaining functional photoreceptors. 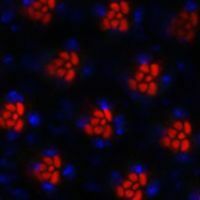 It has been shown to safely elicit and modulate retinal responses in normally sighted rats and in animals blinded by retinal degeneration.2 Arrays with 70 micrometer pixels restored visual acuity in blind rats to half the natural level, corresponding to 20/250 acuity in human. Based on stimulation thresholds observed in these studies, we anticipate that pixel size could be reduced by a factor of two, improving visual acuity even further. Ease of implantation and tiling of these wireless arrays to cover a wide visual field, combined with their high resolution, opens the door to highly functional restoration of sight. We are commercially developing this system in collaboration with the French company Pixium Vision, and clinical trials are slated to commence in 2016. FOLLOW THE LIGHT: A blind patient navigates an obstacle course without the assistance of her guide-dog, thanks to a head-mounted camera and a backpack computer, which gather and process visual information before delivering a representation of the visual scene via her suprachoroidal retinal prosthesis.COURTESY OF NESTLAIR PHOTOGRAPHYFabio Benfenati of the Italian Institute of Technology in Genoa and Guglielmo Lanzani at the institute’s Center for Nanoscience and Technology in Milan are also pursuing the subretinal approach to visual prostheses, developing a device based on organic polymers that could simplify implant fabrication.3 So far, subretinal light-sensitive implants appear to be a promising approach to restoring sight to the blind. Daniel Palanker is a professor in the Department of Ophthalmology and Hansen Experimental Physics Laboratory at Stanford University. K. Stingl et al., “Functional outcome in subretinal electronic implants depends on foveal eccentricity,” Invest Ophthalmol Vis Sci, 54:7658-65, 2013. Y. Mandel et al., “Cortical responses elicited by photovoltaic subretinal prostheses exhibit similarities to visually evoked potentials,” Nat Commun, 4:1980, 2013. D. Ghezzi et al., “A polymer optoelectronic interface restores light sensitivity in blind rat retinas,” Nat Photonics, 7:400-06, 2013. Like subretinal prostheses, suprachoroidal implants utilize the bipolar cells and the retinal network down to the ganglion cells, which process the visual information before relaying it to the brain. But devices implanted in this suprachoroidal location can be larger than those implanted directly above or below the retina, allowing them to cover a wider visual field, ideal for navigation purposes. In addition, suprachoroidal electrode arrays do not breach the retina, making for a simpler surgical procedure that should reduce the chance of adverse events and can even permit the device to be removed or replaced with minimal damage to the surrounding tissues. Early engineering work on suprachoroidal device design began in the 1990s with research performed independently at Osaka University in Japan1 and the Nano Bioelectronics and Systems Research Center of Seoul National University in South Korea.2 Both these groups have shown proof of concept in bench testing and preclinical work, and the Japanese group has gone on to human clinical trials with promising results.3 Subsequently, a South Korean collaboration with the University of New South Wales in Australia continued suprachoroidal device development. More recently, our groups, the Bionics Institute and the Centre for Eye Research Australia, working as part of the Bionic Vision Australia (BVA) partnership, ran a series of preclinical studies between 2009 and 2012.4 These studies demonstrated the safety and efficacy of a prototype suprachoroidal implant, made up of a silicone carrier with 33 platinum disc-shaped electrodes that can be activated in various combinations to elicit the perception of rudimentary patterns, much like pixels on a screen. Two years ago, BVA commenced a pilot trial, in which researchers implanted the prototype in the suprachoroidal space of three end-stage retinitis pigmentosa patients who were barely able to perceive light. The electrode array was joined to a titanium connector affixed to the skull behind the ear, permitting neurostimulation and electrode monitoring without the need for any implanted electronics.5 In all three patients, the device proved stable and effective, providing enough visual perception to better localize light, recognize basic shapes, orient in a room, and walk through mobility mazes with reduced collisions.6 Preparation is underway for future clinical trials, which will provide subjects with a fully implantable device with twice the number of electrodes. Suprachoroidal prostheses can be larger than those implanted directly above or below the retina, allowing them to cover a wider visual field, ideal for navigation purposes. Future work will be required to fully investigate the difference in visual perception provided by devices implanted in the various locations in the eye, but the initial signs are promising that suprachoroidal stimulation is a safe and viable clinical option for patients with certain degenerative retinal diseases. Lauren Ayton is a research fellow and the bionic eye clinical program leader at the University of Melbourne’s Centre for Eye Research Australia. David Nayagam is a research fellow and the bionic eye chronic preclinical study leader at the Bionics Institute in East Melbourne and an honorary research fellow at the University of Melbourne. H. Sakaguchi et al., “Transretinal electrical stimulation with a suprachoroidal multichannel electrode in rabbit eyes,” Jpn J Ophthalmol, 48:256-61, 2004. J.A. Zhou et al., “A suprachoroidal electrical retinal stimulator design for long-term animal experiments and in vivo assessment of its feasibility and biocompatibility in rabbits,” J Biomed Biotechnol, 2008:547428, 2008. T. Fujikado et al., “Testing of semichronically implanted retinal prosthesis by suprachoroidal-transretinal stimulation in patients with retinitis pigmentosa,” Invest Ophthalmol Vis Sci, 52:4726-33, 2011. D.A.X. 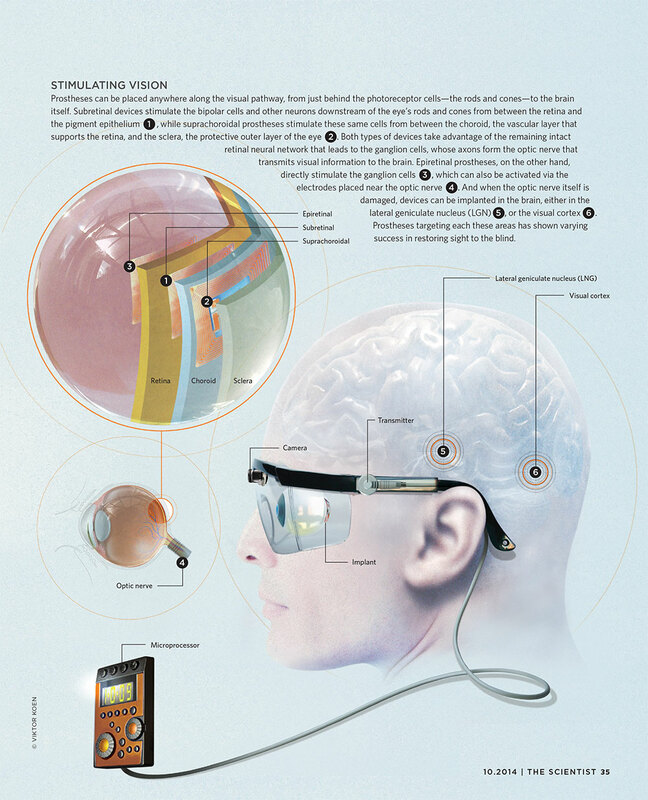 Nayagam et al., “Chronic electrical stimulation with a suprachoroidal retinal prosthesis: a preclinical safety and efficacy study,” PLOS ONE, 9:e97182, 2014. M.N. Shivdasani et al., “Factors affecting perceptual thresholds in a suprachoroidal retinal prosthesis,” Invest Ophthalmol Vis Sci, in press. In 2011, Second Sight obtained approval from the European Union to market its epiretinal device, the Argus II Visual Prosthesis System, which allowed clinical trial subjects who had been blind for several years to recover some visual perception such as basic shape recognition and, occasionally, reading ability. The following year, the FDA approved the device, which uses a glasses-mounted camera to capture visual scenes and wirelessly transmits this information as electrical stimulation patterns to a 6 x 10 microelectrode array. The array is surgically placed in the macular region, responsible in a healthy retina for high-acuity vision, and covers an area of approximately 20° of visual space. 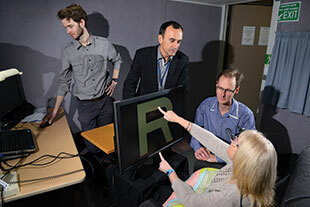 A clinical trial showed that 30 patients receiving the device are able to more accurately locate a high-contrast square on a computer monitor, and when asked to track a moving high-contrast bar, roughly half are able to discriminate the direction of the bar’s movement better than without the system.1 The increased visual acuity has also enabled patients to read large letters, albeit at a slow rate, and has improved the patients’ mobility.2 With the availability of the Argus II, patients with severe retinitis pigmentosa have the first treatment that can actually improve vision. 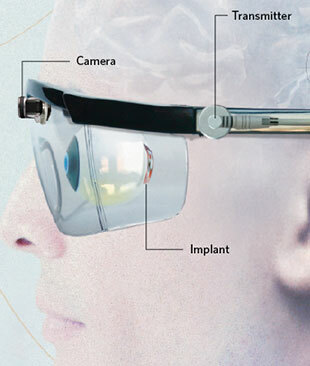 To date, the system has been commercially implanted in more than 50 patients. Several other epiretinal prostheses have shown promise, though none have received regulatory approval. Between 2003 and 2007, Intelligent Medical Implants tested a temporarily implanted, 49-electrode prototype device in eight patients, who reported seeing spots of light when electrodes were activated. Most of these prototype devices were only implanted for a few months, however, and with no integrated camera, patients could not activate the device outside the clinic, limiting the evaluation of the prosthesis’s efficacy. This group has reformed as Pixium Vision, the company currently collaborating with Daniel Palanker’s group at Stanford to develop a subretinal device, and has now developed a permanent epiretinal implant that is in clinical trials. The group is also planning trials of a 150-electrode device that it hopes will further improve visual resolution. Future developments in this area will aim to improve the spatial resolution of the stimulated vision; increase the field of view that can be perceived; and increase the number of electrodes. 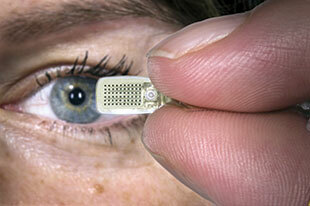 Smaller electrodes would activate fewer retinal ganglion cells, which would result in higher resolution. These strategies will be rigorously tested, and, if successful, may enable retinal prostheses that provide an even better view of the world. Mark Humayun is Cornelius J. Pings Chair in Biomedical Sciences at the University of Southern California, where James Weiland is a professor of ophthalmology and biomedical engineering. Steven Walston is a graduate student in the Bioelectronic Research Lab at the university. M.S. Humayun et al., “Interim results from the international trial of Second Sight’s visual prosthesis,” Ophthalmology, 119:779-88, 2012. L. da Cruz et al., “The Argus II epiretinal prosthesis system allows letter and word reading and long-term function in patients with profound vision loss,” Br J Ophthalmol, 97:632-36, 2013. In addition to the neurons of the eye, researchers have also targeted the brain to stimulate artificial vision in humans. Early experimentation in epileptic patients with persistent seizures by German neurologists and neurosurgeons Otfrid Förster in 1929 and Fedor Krause and Heinrich Schum in 1931, showed that electrical stimulation of an occipital pole, the most posterior part of each brain hemisphere, resulted in sensations of light flashes, termed phosphenes. By the mid-1950s, Americans John C. Button, an osteopath and later MD, and Tracy Putnam, then Chief of Neurosurgery at Cedars-Sinai Hospital in Los Angeles, had implanted stainless steel wires connected to a simple stimulator into the cortices of four people who were blind, and the patients subsequently reported seeing flashes of light. The first functional cortical visual prosthesis was produced in England in 1968, when Giles Brindley, a physiologist, and Walpole Lewin, a neurosurgeon, both at Cambridge University, implanted 80 surface electrodes embedded in a silicone cap in the right occipital cortex of a patient. Each electrode connected to one of 80 corresponding extracranial radio receivers, which generated simple, distinctly located phosphene shapes. The patient could point with her hand to their location in her visual field. When more than one electrode at a time was stimulated, simple patterns emerged. The subsequent aim of the late William H. Dobelle was to provide patients with visual images comprising discrete sets of phosphenes—in other words, artificial vision. Dobelle had begun studying electrical stimulation of the visual cortex in the late 1960s with sighted patients undergoing surgery to remove occipital lobe tumors. He subsequently implanted surface-electrode arrays, first temporarily, then permanently, in the visual cortices of several blind volunteers. However, it was not until the early 2000s that the technology became available to connect a miniature portable camera and computer to the electrodes for practical conversion of real-world sights into electrical signals. With the resultant cortical stimulation, a patient was able to recognize large-print letters and the outline of images. COURTESY OF MVGTo elicit phosphenes, however, the surface electrodes used in these early cortical prostheses required large electrical currents (~3 mA–12 mA), which risked triggering epileptic seizures or debilitating migraines. The devices also required external cables that penetrated the skull, risking infection. Today, with the use of wireless technology, a number of groups are aiming to improve cortical vision prostheses, hoping to provide benefit to millions of people with currently incurable blindness. 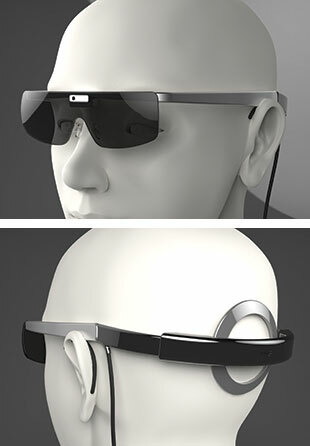 One promising device from our group is the Gennaris bionic-vision system, which comprises a digital camera on a glasses frame. Images are transmitted into a small computerized vision processor that converts the picture into waveform patterns, which are then transmitted wirelessly to small electronic tiles that are implanted into the visual cortex located in the back of the brain. Each tile houses 43 penetrating electrodes, and each electrode may generate a phosphene. The patterns of phosphenes will create 2-D outlines of relevant shapes in the central visual field. 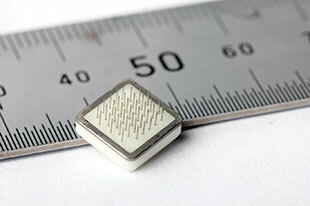 The device is in the preclinical stage, with the first human trials planned for next year, when we hope to implant four to six tiles per patient to stimulate patterns of several hundred phosphenes that patients can use to navigate the environment, identify objects in front of them, detect movement, and possibly read large print. The development in bionic vision devices is accelerating rapidly due to collaborative efforts using the latest silicon chip and electrode design, computer vision processing algorithms, and wireless technologies. Other groups currently developing cortical visual prostheses include the Illinois Institute of Technology, the University of Utah, the École Polytechnique de Montréal in Canada, and Miguel Hernández University in Spain. All these devices follow the same principal of inducing phosphenes that can be visualized by the patient. Many technical challenges must be overcome before such devices can be brought to the clinic, however, including the need to improve implantation techniques. In addition to the need for patient safety, accuracy and repeatability when inserting the device are important for maximum results. Development of bionic vision devices is accelerating rapidly due to collaborative efforts using the latest silicon chip and electrode design, computer vision processing algorithms, and wireless technologies. We are optimistic that a range of practical, safe, and effective bionic vision devices will be available over the next decade and that blind individuals will have the ability to “see” their world once again. Collette Mann is the clinical program coordinator of the Monash Vision Group in Melbourne, Australia, where Arthur Lowery, a professor of electrical engineering, is the director. Jeffrey V. Rosenfeld is head of the Division of Clinical Sciences & Department of Surgery at the Central Clinical School at Monash University and director of the Department of Neurosurgery at Alfred Hospital, which is also in Melbourne.